13th St. NAC Cat Rescue hasn't added a story. We began as a small group that was tasked to TNR (trap, neuter, return) cats and kittens in the downtown neighborhood, with only a $500 grant. Needless to say, that money was quickly spent on cats that needed medical care or recovery care that prevented the simple "return" part of the process. We received another grant of $500 and then with the fundraising need for Stevie - our mascot - our little group became official. In order to keep care of the cats that come in and out of our lives, we are fundraising in celebration of our 13th year. Each donation, big and small, will help us reach our goal and allow us to continue caring for any feline that comes our way. We sincerely appreciate your thoughtfulness and support. Let’s reach our goal! There are no fees for donating via Fundrazr. After clicking Donate, next to "Help us keep fundraising free" change their fee amount to $0. 13th St. NAC Cat Rescue hasn't posted any updates yet. 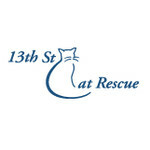 13th St. NAC Cat Rescue is managing the funds for this campaign.